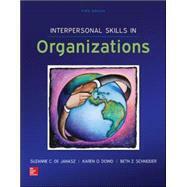 Interpersonal Skills in Organizations by de Janasz, Dowd, and Schneider takes a fresh, thoughtful look at the key skills necessary for personal and managerial success in organizations today. Exploding with exercises, cases, and group activities, the book employs an experiential approach suitable for all student audiences. The book is organized into 4 distinct sections (Understanding Yourself, Understanding Others, Understanding Teams, and Leading) that can be used collectively or modularly depending on the instructors' preferences and students' needs. The emphasis in this edition focuses on making the text more current along with making the text pedagogically effective for students and instructors.